Afghan President Hamid Karzai gestures as he addresses media representatives in New Delhi on December 14. 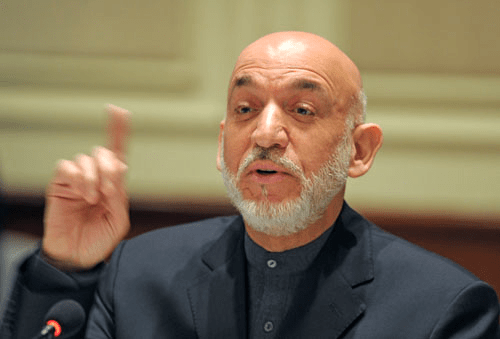 Karzai has renewed calls for U.S. forces to cease unilateral operations in Afghanistan after Marines accidentally killed a young child while returning fire during a recent attack in Nad-e Ali. The recent death of a young Afghan child who was caught in the cross fire between Marines and insurgents has increased tensions with Afghan politicians as U.S. leaders negotiate the terms of their military presence beyond 2014. The death of the child in Nad-e Ali province occurred when Marines returned fire during an attack, Reuters reported Jan. 10. Exact details of the incident remain unclear, but it has prompted renewed calls by the Hamid Karzai administration for U.S. troops and the entire International Security Assistance Force to cease unilateral operations in Afghan villages and homes. The accident is being blamed on poor visibility by a spokesman for the province’s governor, according to various media outlets. Mourn the death of civil child, an innocent. But I believe that all this was a fluke of the moment. We hope that this problem does not interfere to promote peace.